The DJI Ronin-S is a convenient handheld gimbal that stabilizes videos shot on a compatible DSLR or mirrorless camera. By buying this product you'll earn up to 749 Rewards points. 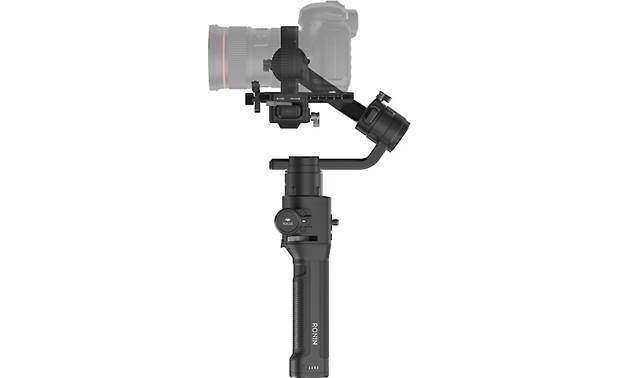 The DJI Ronin-S is a convenient handheld gimbal that stabilizes videos shot on a compatible DSLR or mirrorless camera. There's a handy button that starts and stops recording, and a thumb wheel so you can change the camera's focus easily while you're shooting. It's ready for action, with a Sport mode that smoothly captures fast-moving scenes, and a front trigger that changes the camera orientation from upright to underslung quickly. payload capacity: up to 7.9 lbs. 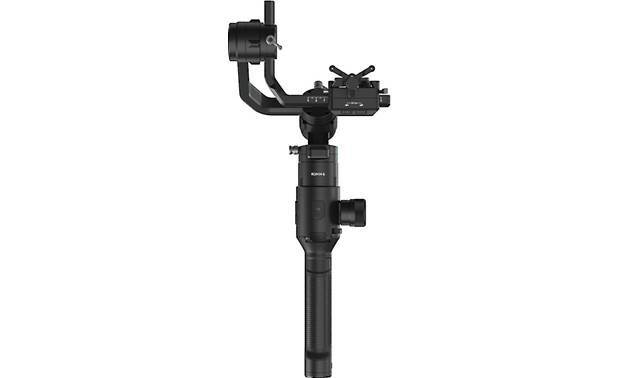 Camera Stabilizer Gimbal: The DJI Ronin-S is a professional 3-axis single handled gimbal that's specifically designed for DSLR and Mirrorless cameras. It gives independent filmmakers the power to capture spontaneous moments with clarity, smoothness, and a refreshing perspective. Designed in a single-handed form factor for DSLR and Mirrorless cameras, the Ronin-S empowers your to shoot with the freedom of stabilized shots on the move. Detachable Modular Design: The DJI Ronin-S consists of three detachable main components - gimbal, handheld grip, and extended tripod grip. 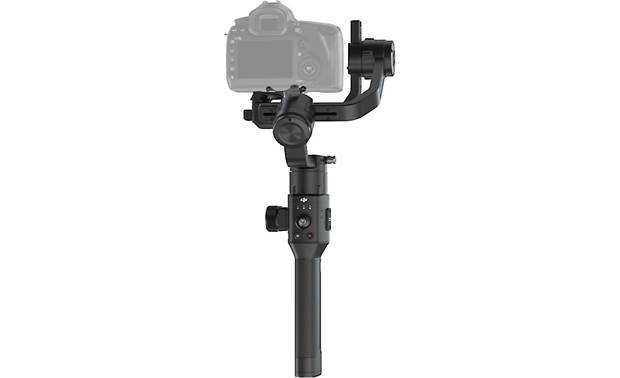 This detachable, modular design of the Ronin-S offers numerous usage scenarios (it can be handheld, attached to a tripod, or mounted to a vehicle). This detachment feature also makes it more convenient for easy storage and travel. The maximum depth from the center of gravity of the camera base plate should be 3.85" (98mm). The maximum height, measured from the top of the camera base plate should be 5.9" (150mm). The maximum width of the camera should be 8.07" (205mm). The maximum payload capacity is 8 lbs (3.6 kg). Note: Click here for a list of compatible cameras (as of 11/19/2018). No camera is included with the DJI Ronin-S.
Controls: The Ronin-S comes with an array of controls (joystick, dial, and push-buttons) that allow you to operate the gimbal's movement, switch control profiles, and change working modes easily. The front-mounted joystick is multidirectional, allowing you to move up, down, left, right, and in all diagonal directions. The front Trigger button allows you to instantly turn off SmoothTrack, re-center the gimbal, and turn it around 180-degrees. Used with the provided camera control cables, the Ronin-S is also able to control shutter, recording, and focus. Ronin App: The Ronin app (for Apple iOS 9.0+ and Android OS 4.4+) allows you to use your compatible mobile device to set up and fine-tune gimbal performance with settings for features like SmoothTrack, motor parameters, and various intelligent functions. The Ronin-S wirelessly communicates with your Apple iOS or Android device over Bluetooth. When controlled via the Ronin mobile app, the wireless operating range is approximately 32.8' (10 meters). Auto Tune: The Auto Tune feature can automatically calibrate motor stiffness based on mounted payload and tuning aggressiveness. Auto Tune can be accessed via the Ronin app on your Apple iOS or Android OS device. Three preset Auto Tune aggressiveness levels can help you modify the stiffness output value. The Low preset is optimized Auto Tune for scenarios where only slow movement is involved. When the Ronin-S is mounted to a vehicle or used for a fast-moving scene, the High preset can ensure optimal gimbal performance (powerful, high torque motors actively can stabilize your shot when mounted to moving platforms at speeds of up to 46.6 mph). The Mid preset is designed to provide a satisfactory outcome for most cases and is the default setting. The Auto Tune process takes approximately 40 seconds. Note: Before performing Auto Tune, mechanical balance adjustment will be necessary. SmoothTrack: SmoothTrack enables the Ronin-S to intelligently react to and follow the operator's movement without input from a second operator, allowing you to transition from motion to camera angle with one hand. You can selectively enable SmoothTrack on all 3-axes (Pan, Tilt, and Roll) of the Ronin-S and select between 4 user profiles - Underslung, Upright, Flashlight, and Sport. Simply hold down the front trigger to transition from Upright to Underslung Mode in one seamless movement with no gimbal framework obstruction. 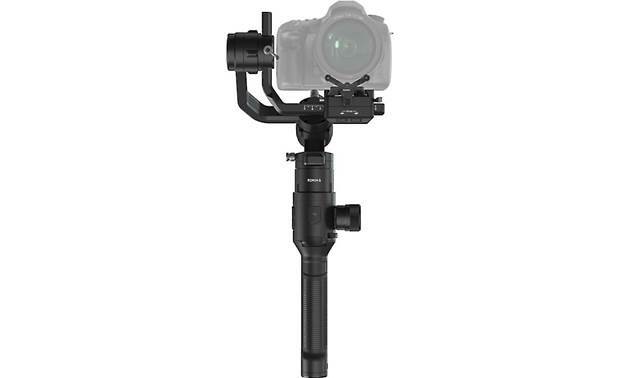 The ergonomic design of the Ronin-S frees unwanted shake when shifting from Underslung to an upright position in one smooth take. The new Sport Mode allows you to capture fast-moving scenes instantly by holding the button down. Underslung Mode: Film effortlessly and comfortably in the most common shooting mode, holding the Ronin-S directly in front of you at chest level. 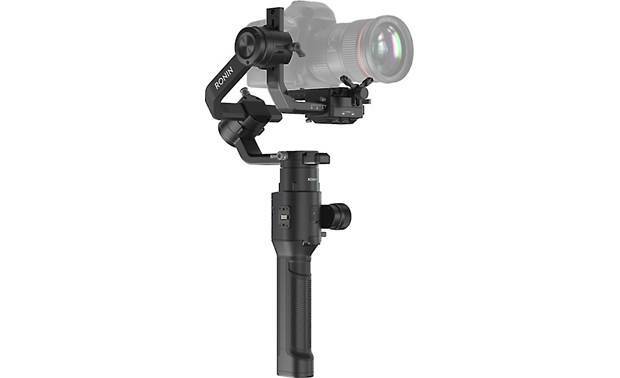 Upright Mode: Shoot at or above eye-level by flipping and lifting the lightweight Ronin-S above your head. This mode is perfect for shooting out of a car's sunroof or above a crowd of people. Flashlight Mode: Turn the gimbal vertically and hold it by your side or in front of your chest like a flashlight to shoot 360-degree (Roll) video. Sport Mode: In Sport mode, the Ronin-S will maximize its responsiveness while maintaining stability of the camera to help you capture stunning fast transition shots or keep a high-speed subject in frame properly. Focus Wheel: Focus better on your subject with the easy-to-control Focus Wheel of the Ronin-S. When a compatible camera system connects to the Ronin-S, you can pull focus via the included cable. The Focus Wheel will need to be installed to the 8-pin port of the Ronin-S. Your camera will also need to be connected to the Ronin-S via USB. In addition, and optional external motor (sold separately) can be added, bringing broader compatibility to all lens types while enhancing precision control. Automated Creative Features: The Ronin-S includes a suite of automated features within the DJI Ronin app (for Apple iOS and Android OS), letting you produce even more creative professional footage to unlock your true filmmaking potential. Panorama: The Panorama mode allows you to capture a series of interconnecting still images with precise control based on your camera's sensor type, lens focal length, and desired overlap rate. The Delay parameter is designed to improve image quality by ensuring the gimbal stays still after the camera's shutter has been triggered. Thanks to the slanted Roll motor design, you can view the path of the panorama through the built-in display of your camera with little obstruction. The Tilt axis range in Panorama mode is +/- 45 degrees to avoid capturing the gimbal in the shot while the Pan axis range allows you to capture a full 360 degree rotation. Timelapse: In Timelapse mode, the Ronin-S will trigger the camera to capture still images with your desired interval time and will automatically stop when its done. You can set up the desired content duration for the final output timelapse clips and your project frame rate so that the Ronin-S can calculate the exact number of image required. Motionlapse: Motionlapse allows you to set up to 5 waypoints for your timelapse shot to add more motion in the content. Track: The Track feature is designed to capture video with up to 10 waypoints. The travel speed in between two waypoints can be set as desired allowing you to couple the Ronin-S with other platforms such as a motorized slider or an RC buggy to automate gimbal movement. System Calibration: System calibration is designed to counteract gimbal drifting caused by accumulated sensor errors. Before initializing the calibration process, the Ronin-S must be placed on a level surface without being disturbed. Use System Calibration when you notice that the gimbal is drifting or when the horizon is tilted. You can also reposition the Ronin-S manually in Push Mode allowing you to reposition the Pan, Tilt, and Roll axes of the gimbal by using your hands. Rechargeable Battery: The Ronin-S utilizes a built-in LiPo rechargeable battery (2400mAh/14.4V). A fully charged battery can power the Ronin-S continuously for 12 hours if the gimbal is properly balanced. It takes approximately 2 hours and 15 minutes to charge the battery fully when using the 24W USB Power Adapter. 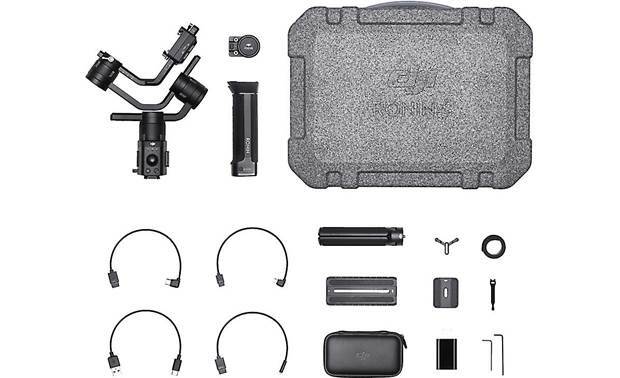 You'll need to connect the included grip to the Ronin-S gimbal before you can connect the Ronin-S to the supplied USB power adapter using the included USB-C cable. Optional Accessories: The Ronin-S offers multiple accessory mounts, providing full support for add-ons such as a microphone, LED lights, and even an external monitor (all sold separately). 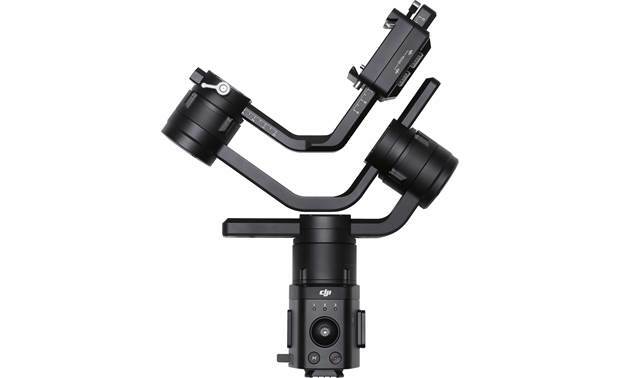 Compatibility with DJI control devices (sold separately) offer a wide range of control, such as Force Pro for intuitive operation and Master Wheels for precise gimbal movements. The Ronin-S also features an S-Bus port for compatibility with third-party remote controllers (sold separately). Firmware Updates: Firmware updates are done through the DJI Pro Assistant for Windows 7 and newer, or Mac OSX 10.11 and newer. The Ronin-S will need to be connected to your computer via USB. Operating Temperature: The Ronin-S has an operating temperature of 4°F (-20°C) to 113°F (45°C). Note: The DJI Ronin-S is not water or dust proof. Ensure to protect it from harmful dust and water during use to prevent damage. 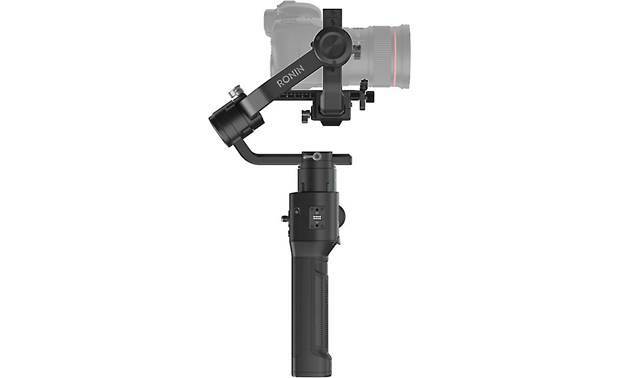 Searches related to the DJI Ronin-S Handheld gimbal mount for DSLR and mirrorless cameras.